Cord blood also called placental blood is located in the placenta and the umbilical cord. This blood can be collected from all mammals. The first researches on its components and benefits were made on mice. In humans, cord blood is collected after the birth of a child, then it is analyzed to quantify the number of white blood cells and stem cells it contains. It is then preserved in order to use the stem cells it contains in the future. Parents can donate cord blood to a public bank so that it can be used to save the life of a child or an adult mainly in certain cancers. It may also be stored in a private bank for personal use but it costs money and the likelihood of using cord blood in a family is less than 0.04%. It is important to know that cord blood stem cells are not embryonic. The umbilical cord contains hematopoietic and mesenchymal stem cells (i.e., blood and tissue cells, respectively). The main category of cord blood stem cells is known as hematopoietic. These cells called 'mothers' are also present in the bone marrow. They provide all the red blood cells, platelets and white blood cells necessary for life. In stem cell transplantation formerly called bone marrow transplantation, compatibility between donor and recipient is necessary for a successful transplant. Parents are 50% compatible with their children as each parent gives half of its genetic code to the child. Among brothers and sisters of the same parents, the probability of compatibility is only 25% or one in four children. In humans, umbilical cord and placental blood is collected after the cord was severed in the newborn. Blood can be collected while the placenta is still in the uterus, this method is called in utero. 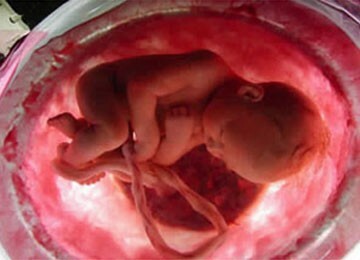 It can also be collected after the expulsion of the placenta from the uterus, this method is called ex utero. When it is collected ex utero, the placenta is placed on a sterile support structure that lets the cord hang. After disinfection, a needle connected to a bag is inserted into the vein of the cord. Cord blood is then collected by gravity into a collection device similar to that used during blood donation, which allows a mean of 75 mL (generally between 10 and 250mL). Before storage in a public bank, the collected blood is analyzed for infectious agents and tissue type is determined. In most public banks, cord blood is processed to remove red blood cells before being stored in liquid nitrogen for later use. Various methods of manipulation are made to preserve hematopoietic stem cells. A reduction in the volume is achieved after blood centrifugation. Plasma and / or red blood cells are removed leaving only a layer called buffy coat. Some cord blood banks only remove red blood cells, others only plasma, but the majority will remove most of the red blood cells and plasma to reduce to a final volume of 20 to 25 mL. In order to preserve stem cells for a known period of about 25 years, a preservation solution called DMSO (dimethyl sulfoxide) is added to the final product before cryopreservation (preservation by cryogenic temperatures, i.e. below-150°C). The units are then stored in liquid or vapor nitrogen freezers. Since the late 1980s, cord blood stem cells have been used to treat hematologic cancers. Other diseases such as genetic diseases are likely to be treated with these cells but this probability is only part of preliminary studies. Cancers currently treated with stem cell transplants are among the types of leukemia, lymphoma and myeloma. This applies at present to about 75 diseases. Here is a non-exhaustive list of diseases being treated with cord blood stem cells.